Have you ever eaten something so delicious for the first time and wondered how the heck it took you so long to discover it? I’m sure all of us foodies have. 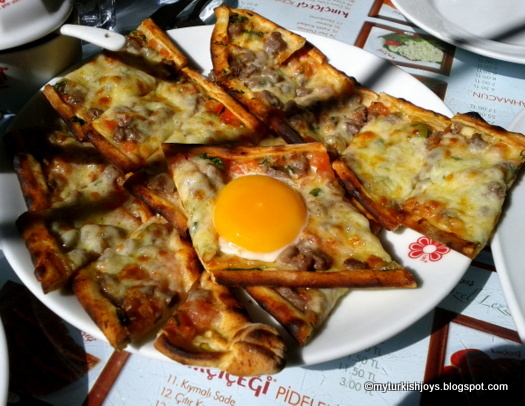 In Istanbul, one of those recently discovered items is pide yumurtalı (Turkish pizza with egg). 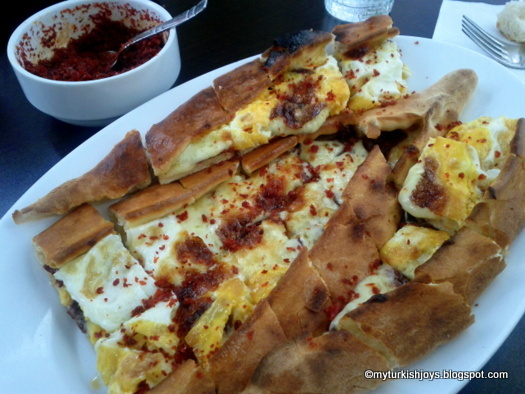 I used to order my pide with sucuk and kaşar peynir (Turkish cheddar cheese). Then, one day, the photo on a menu of a pide with a sunny yellow egg on top jumped out at me. I want that one I pointed out on the menu. Unfortunately, the egg didn’t come out as oozing sunny side up as it looked like in the picture, but it was delicious. Often, we’ve walked past a small pide shop near the Saturday pazar in Beşiktaş. One day, at my urging, we finally decided to stop and warm up with a bowl of soup and a pide. Karadeniz Pide Kebab ve Yemek Salonu is a simple place where you’ll find two or three daily soups, a few meze items and pide. I love the fact that almost every Turkish café serves soup! If you can resist the gözleme at the pazar, stop by Karadeniz for a quick lunch. I think the cost for the two us was 24 tl ($13 USD). Now, the best place I’ve discovered to eat pide yumurtalı is at Kırçiçeği in Ortaköy. Somehow, I received the most lovely, golden, oozing egg on top of my pide. I used the crispy crust to dip into my egg. Amazing! Kırçiçeği, which means wildflower in Turkish, has several locations in Istanbul as well as Izmir, Bodrum and Ankara. This family-owned company, originally from Aydın, has been open since 1985. Now, I haven’t quite figured out how to say that I want the egg to be sunny side up like I had at Kırçiçeği. Can anyone advise what Turkish words I need to say when I order my pide next time? this is a good reminder that i need to make this again. i love mine the same way with a sunny side up egg, though god knows, i have no idea how to say that in turkish! Oh my yes, this is my favourite food ever. When I was working in Turkey for a year (about ten years ago) and the workplace covered the cost of my lunches, I had yumurtali pide, homemade salata and firinda sutlac every day for the entire year. I wish I was eating it right now! There is no word you can say instead of sunny side up. You have to tell them you want to egg with your pide but yumurtanin sarisi pismesin . Best way I beleive keep your pide picture with you and show them before you order. Maybe ask them to put the egg on half way through the cooking. I think you may say as you want your Pide with Egg(in Turkish): "Yumurtanin sarisi dagilmasin!".. @Joyce, Good reminder then! Do you just bake yours in a regular oven? I imagine a stone tray would be nice. @Deniz, Sounds like a perfect lunch to me too! 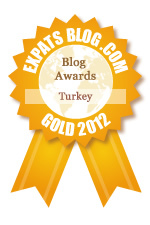 @Acemi Sef Meysun, thanks for the tips! And yes, a photo could be better than trying to say that. @notesfromkitchen, Thank you! You gave the same advice as Acemi Sef Meysun did earlier.